Beautiful Amish made wood chests ,hope chests, blanket chests, cedar chests, steamer trunks....Shipped anywhere in the U.S.A.
We have over 100 chests in every style and color IN STOCK ready to go! Stock Hope Chest orders ships next day! All custom Chests are being shipped (4) weeks from order date. Go directly to our Chest Options Page...HERE. You found us! The #1 site for handmade solid wood products that will last a lifetime. Specializing in handmade, Genuine handmade by the Amish. 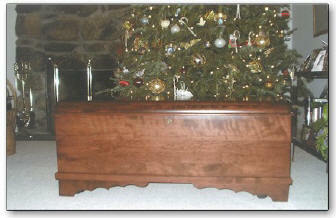 Wood chests, cedar Chest, hope chests, blanket Chest, quilt racks and armoires. Hope Chest - Craftsmanship that can be passed down for generations. We have many wood chests in stock and ready for immediate Delivery. All our hope wood chests are solid wood. We finish all four sides. You do not have to hide the back of our hope chests against the wall. We have a great selection of solid wood chests, cedar chest and Armoires ready for immediate shipping. Our daughter's high school graduation hope Chest has arrived. It is absolutely beautiful! We couldn't be happier with it. Thank you so much. We will be contacting you again in the next few years when our 13 and 15 year old daughters graduate. Please scroll down for more feedback and important Information. Now available - Quilt racks !!! Construction of our Wood Chests, Blanket Chests, Hope Chest, Cedar Chest, Toy Boxes and Armoires is of solid wood taken from North American hardwood trees. 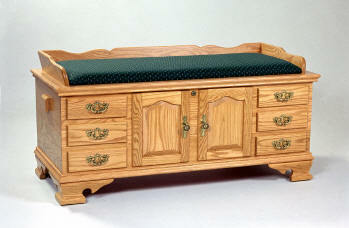 In both manufacturing and finishing, we try to bring forth the character of the wood Chest. The beauty of hardwood is an expression of nature. It is not engineered nor is it synthetic; its beauty is not only "skin deep". Just as every tree in nature is a little different from the next, every Hope Chest is one of a kind. 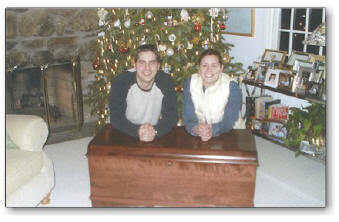 Solid hardwood furniture offers pleasure and utility throughout an entire lifetime and beyond. enduring designs and quality construction allow Blanket Chests to hold its value decade after decade Our wood chests, hope chests, cedar chest, armoires are sure to last a lifetime. Chris, Kipp and I wanted to thank you very much for your wonderful craftsmanship. I fell in love with the hope chest the second I saw it. I know you and Kipp spoke several times in order to make sure you were building the chest I would love. I have received many compliments from friends and family who have seen it, and we wanted you to know that while you may think you were building a piece of furniture, you were helping (2) young people build a life. It was such a sentimental gift and it will always mean so much to me. Thank you for making this happen for us. You probably never get the opportunity to see the people you sell your products to, so we thought we would enclose a picture of us on Christmas. I hope you can see how happy you made us. Thank you again, Kipp & Meagan, Waltham, MA. to my friends and coworkers. become an heirloom in our family. PS: If you ever need a reference, please feel free to contact me.